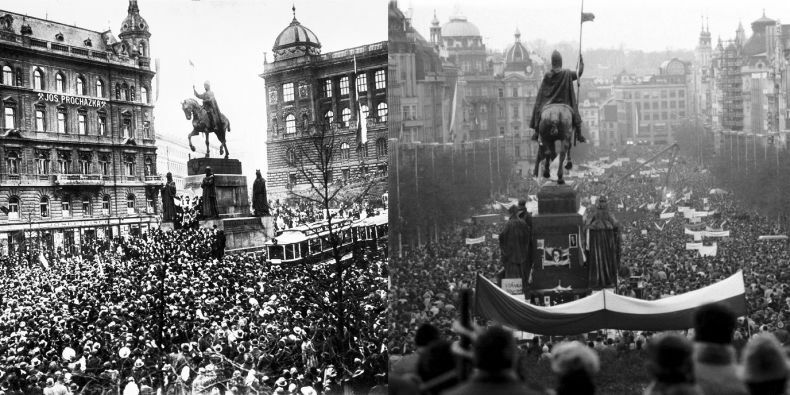 Wenceslas Square in October 1918 after declaration of independence and in November 1989 during Velvet Revolution. 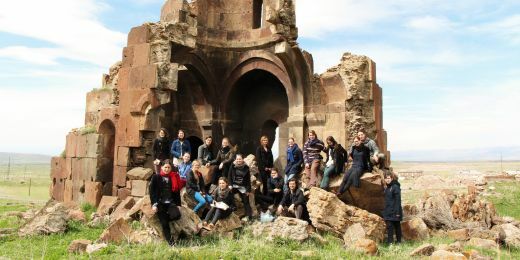 In celebrating 1918, we are first and foremost celebrating the end of the communist regime in 1989 and the resulting “homecoming” – coming back to a place where we have the right to be politically independent. It is not a misplaced question to ask what are we actually celebrating on 28 October 2018? The current Czech Republic came into being at the beginning of 1993, while the Czechoslovak Republic founded a hundred years ago no longer exists and went through so many transformations during the terrifying 20th century that it might almost seem as if it was a series of different countries. Therefore, the starting point may be, to quote Milan Kundera, that the existence of our country is “non-obvious”. We have to make a conscious decision about what matters to us. 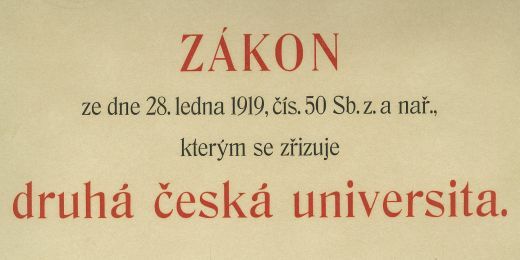 For example, we want to espouse the better part of our more recent history: the First (pre-World War II) Czechoslovak Republic, President Masaryk, historical figures such as Švehla, Durych, and Peroutka, the anti-Bolshevik Czechoslovak Legion, the anti-fascist and anti-communist resistance movements, and the celebrated works of art, whether created here or in exile… We celebrate what we choose to celebrate. We create continuity. 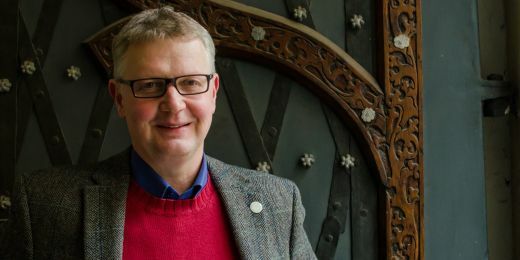 A historian asked to talk about the hundred years of Czech (or Czechoslovak) independence is in a quandary, as they cannot avoid mentioning the problematic points of the newly established republic. The year 1918 marked the end of the central thesis of Czech politics up to that point, which was that the Czech state and culture is unimaginable without the wider Central European context – in other words, without Austria-Hungary. We often forget that it was the liberal era of the old empire that made the Czech cultural renaissance possible. The modern Czech identity and consciousness took shape before the events of 1918 – they were only the icing on the cake. Prior to 1917, the idea of an independent state was a marginal and radical one. In a way, it was a gift from history and the new Czechoslovakia had to show whether it could handle such gifts. In this sense, the first twenty years were a happy period, even with its problems. While Czechoslovakia took a stand against Austria-Hungary, it resembled the old empire in many respects. 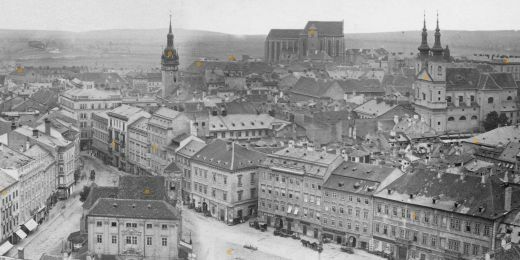 There were stitches on the “body” of the new state – the Slovaks, the German-Bohemians – that threatened to tear it apart right from the start. Nevertheless, the First Czechoslovak Republic and its achievements in creating political and cultural institutions is something that we can build on. After all, those who created the First Republic were the same people that stood by their nation and country during the most difficult times – the Nazi occupation and the communist regime. Historians and political scientists often point to the decade between 1938 and 1948 as the source of the “shifts in mentality” that resulted not only in the break-up of Central Europe as a political and geographical unit but also led to the unprecedented development that led us under the tutelage of the USSR. 1948 – another anniversary to “celebrate” this year – marked the symbolic end of a sovereign state that sold its independence for an ideological bowl of soup for forty years. But even in this, there is something to remember. If nothing else, then at least the indomitable hope, which survived even the hard times, that the right to self-govern will eventually be regained. Those forty years are also divided into two parts by the Soviet invasion of 1968, which showed the true face of the Soviet regime and all the weaknesses of the political systems that were based on it. In celebrating 1918, we are first and foremost celebrating the end of the communist regime in 1989 and the resulting “homecoming” – coming back to a place where we have the right to be politically independent, to live without pretence, foster an independent culture, celebrate the values that the communist regime attempted to erase from our national memory, and to teach and research without political hindrance – even though we now know that coming back is not easy. The Czech Republic has decided to celebrate 1918. It is meaningful – in fact, there is no way we could not celebrate it. States live on the ideas on which they were founded. An independent Czechoslovakia co-existing with other independent Central European states and relying on Western security structures is a concept that has potential and that is very close to what our ancestors – or at least the more reasonable ones – were striving for. Author is from Department of History, MUNI Faculty of Arts.